Have you ever watched home decorating programs and thought “It must take them forever to find the items in that room that match perfectly” then you're in the same boat as me! Until I started using Houzz which changed home decorating for me forever! I spend endless hours looking through room guides and everything in the rooms are tagged to show you that product and many other similar products to it. Meaning, even if you dont like the exact item in the room you get multiple options which are very similar so you can customize it. So when I was playing in the Shareasale affiliate portal the other day on another affiliate program I saw “Houzz” sitting there and instantly was excited to share this with you guys! Introducing… The Houzz Affiliate Program! Before I get too far into it, for you home decor buffs that love Houzz already but dont really know how affiliate programs work, i'll give you a bit of information first. Affiliate programs are setup by companies to give you (the affiliate partner) tools to advertise their companies products and services. When you advertise and drive traffic to their site, that traffic may end up generating potential sales. If any of those visitors do make purchases, you get a cut of the profits. Each company has different rules, commission %, tools, etc, and thats what we're going to review here. What Type Of Products Are Featured? So Houzz is an eCommerce site which is specialized in home decoration. Their site is designed around making home decorating simple and easy! Whether you know alot about home decorating or just a little, the way they designed their site you can find inspiration all over to decorate your home exactly to your liking. Photo Inspiration: Here is where you can browse by rooms to see products and inspiration to get you going in the right direction. If you are designing your kitchen, simply select kitchen. They have over 2 million user inspired kitchen ideas. Each of the ideas include photos that have most of the products linked to their products for sale. If you love one of their rooms, simply click on each item to see how you can purchase it. Shopping by Department: Here is where you can narrow it down by department whether thats “kitchen sink” or “bathroom rugs” and you'll see every item they have on listing under that department. Finding Professionals: If you need to seek professional help (which, lets be honest – we all need a little help sometimes! ), select the area of help you're looking for. Lets say for example you need a fireplace installed, just select the fireplaces option, enter your location and you'll get the results of who's near you that specializes in fireplaces including contact information. Stories and Advice: This is where bloggers like us come in! They have a long list of blogs which help teach you how to both use Houzz and how to decorate your home like a pro. You can search by categories like “kitchen design” or “landscape designs” and they'll show you everyone who has stories and advice on how to do these designs easily. If you dont have experience, then this is the place to start learning. There's so much more to discuss about Houzz's site, but now we have to get into the affiliate program information. If you want to checkout Houzz's site go to www.houzz.com. Houzz offers a fairly competitive commission rate of 5% on all sales completed. This does not fluctuate per department or product type as it is a flat % on all sales completed on the site. Overall 5% is pretty standard for eCommerce sites although I have seen a few that go below 5% so it stands up pretty well against the competitors. This is pretty darn good because five percent on a $2,000 couch is a good commission! When using their affiliate advertisements on your site or social media, any customer who clicks on your links will have 30 days to shop for you to get credit for the sale commission. This works by using cookies. When someone clicks your links the system remembers that customer was referred by you. After 30 days, this is no longer valid and any purchases they make will no longer count towards you for commission. This means you have to keep driving customers to Houzz's site to achieve additional sales commissions. Wholesale Furniture Brokers: A Canadian based company but steadily growing year over year. They offer both home and office furniture, decorations, mattresses, and much more. They offer their affiliate partners a 5% overall commission on their affiliate sales. Joss and Main: This company offers the most similar niche to Houzz as they offer great design ideas along with their great products including furniture, bedding, home decor, lighting, rugs, etc. Their affiliate program offers a flat 6% commission on sales completed as well. Both of the above 2 are great programs, however, in comparison to what Houzz offers on their site they are still well behind in terms of offerings and technology. Houzz's site is really superb as it combines everything into one. Whether you're a home owner, a professional interior decorator, or a builder/contractor, there are many ways that you can utilize the Houzz Affiliate Program. Lets start with interior decorators and see how you can utilize it. Every day you decorate homes and offices both indoor and outdoor. Often times you utilize Houzz already to purchase and decorate these places. Sharing your completed work on either your social media site or your website/blog is a great way to give ideas to your visitors on great decorations. You can then link many of the products you used using the Houzz affiliate program. Similarly, if you're a contractor specializing in kitchens then you know the best materials and appliances to use. Every day you spend time with those materials making kitchens beautiful. You can create content on your website sharing that knowledge with others and teach them what to do and what not to do. 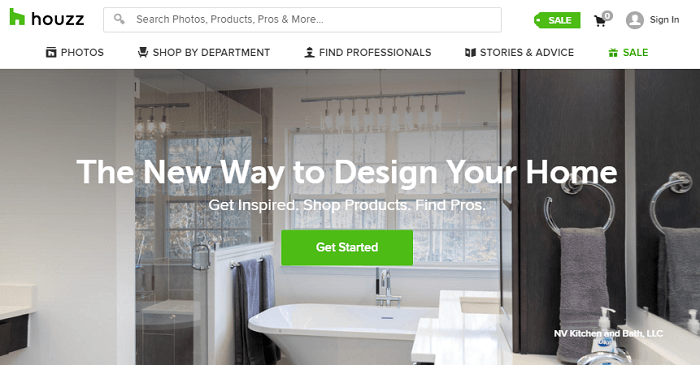 Can You Make Money With The Houzz Affiliate Program? So how do you actually use the Houzz affiliate program tools to make money? That's the easy part! Houzz utilizes a 3rd party affiliate portal called ShareSale. You can sign up for Houzz's affiliate program by going here: https://info.houzz.com/partner.html. You'll be prompted to sign up for ShareSale. Once you've successfully signed up for ShareSale you'll search for Houzz under merchants and apply for the program. Houzz does have to manually approve you in order to be able to start advertising for them. It took me only 24 hours to get signed up though. Once you're signed up you'll see Houzz under your merchants. Upon clicking on Houzz you'll see all of the details including the commission, terms and conditions, average conversion and commission rates, etc. To advertise with Houzz, simply click the “Get Links” button to be taken to their affiliate tools. Text Links: Houzz utilizes two different types of text links which I want to differentiate. Under the “Text Links” option that you see above you will have access to almost 80 different unique URLs which will take you to different specific sections of Houzz's website. For example: “Bar Stools by Houzz” or “Mirrors on sale” or “Outdoor furniture – 50% off” etc. Banners: Under the banners tab you'll find different banners which you can utilize on your site. While there aren't that many, you can still utilize the ones available to add image links on the sidebar or within the content of your site. Deals/Coupons: Use this tab to get access to different products which are on sale or have a special deal. Datafeed: The datafeed differs from text links in that this is specific products. You'll notice there are over 11 million products available under datafeed. You can easily access all products by downloading a CSV Excel file. You can also search for specific products or filter by product types. For each of the above on the right side simply click the “Get HTML Code” button to get the link you should use when hyperlinking things or for placing banners. This HTML code will already have your affiliate partner ID embedded into it so you get credit for any sales made within 30 days from these links. Pros: Houzz utilizes the ShareSale affiliate partner portal which I dont usually like affiliate portals, but ShareSale is one of the best on the market. It's simple to use and has great tools available at your disposal. Houzz also offers it's affiliate partners not only a good 5% commission, but also over 11 million products making it easy to find things to advertise. Also, the price of some of these items makes the 5% commission even more attractive, PLUS, people tend to redo an entire room at one time, making it possible for you to make multiple sales from one person. One more PRO is that the items featured on Houzz will work really well with an email list, trickle-feeding new decoration ideas over the course of months or years to the same, interested parties. Cons: The only downfall to using Houzz's affiliate program is that many of these items end being “in person” buys, even though people do research online. People don't trust color-definition and fancy photography editing, and they want to see the item in person. You really have to encourage people to buy it online! Additionally I was a bit disappointed that they did not have many banners under their affiliate portal. This made the work of making banners on your own necessary and then hyperlinking those images with a URL from the text links. Hope you enjoy using the Houzz affiliate program and if you have any other home decor programs that you enjoy using, let me know here in the comments below. Hi, you mention Houzz services, but you don’t discuss the affiliate opportunities with services (i.e. general contractor). Do you know if they offer a commission on professional services? Nice article and thank you. Great question Malcom – I’m not sure!